19 1ST READER - cont'd since truth has no form, as your scholastic pedants state, what then is right or left? Where then is the source of the echo saying right or wrong? 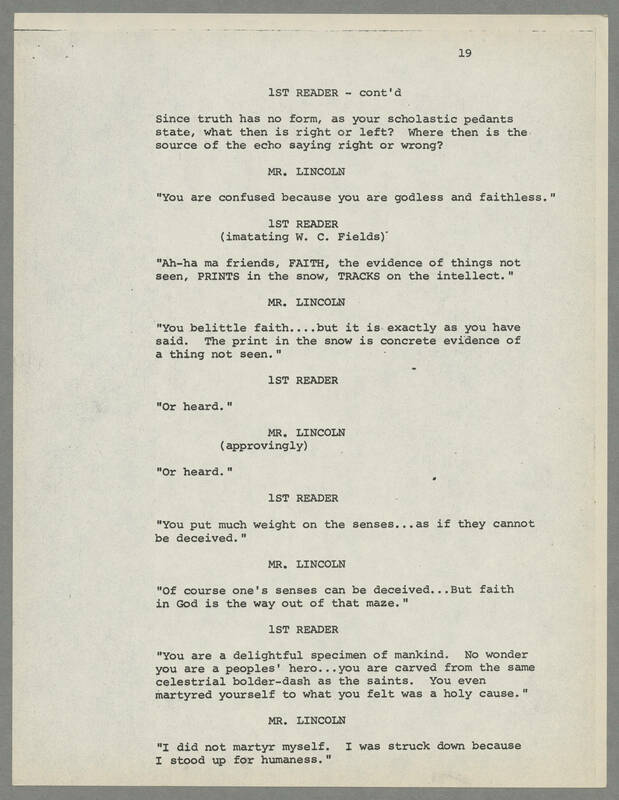 MR. LINCOLN "You are confused because you are godless and faithless." 1ST READER (imitating W. C. Fields) "Ah-ha ma friends, FAITH, the evidence of things not seen, PRINTS in the snow, TRACKS on the intellect." MR. LINCOLN "You belittle faith....but it is exactly as you have said. The print in the snow is concrete evidence of a thing not see." 1ST READER "Or heard." MR. LINCOLN (approvingly) "Or heard." 1ST READER "You put much weight on the senses...as if they cannot be deceived." MR. LINCOLN "Of course one's senses can be deceived...But faith in God is the way out of that maze." 1ST READER "You are a delightful specimen of mankind. No wonder you are a peoples' hero...you are carved from the same celestrial bolder-dash as the saints. You even martyred yourself to what you felt was a holy cause." MR. LINCOLN "I did not martyr myself. I was struck down because I stood up for humaness."